Most of us use Google to search for information on the web. One search engine for the entire web. How do we search for information in various accounts we have on web services like Gmail, Facebook, Twitter. We search them individually as if they are all silos. A new web service called Greplin breaks down the wall between these silos of information and lets you search across your favorite web services with one Google-like search interface. Here is how Greplin works. 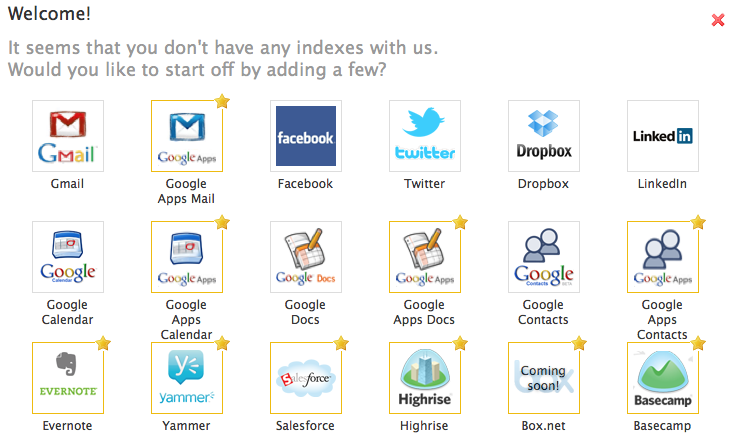 You hook up your Gmail, Facebook, Twitter, Dropox and LinkedIn accounts to Greplin. They index all your data. Now, you just use Greplin to find information across all these accounts in one shot and at lightning speed. 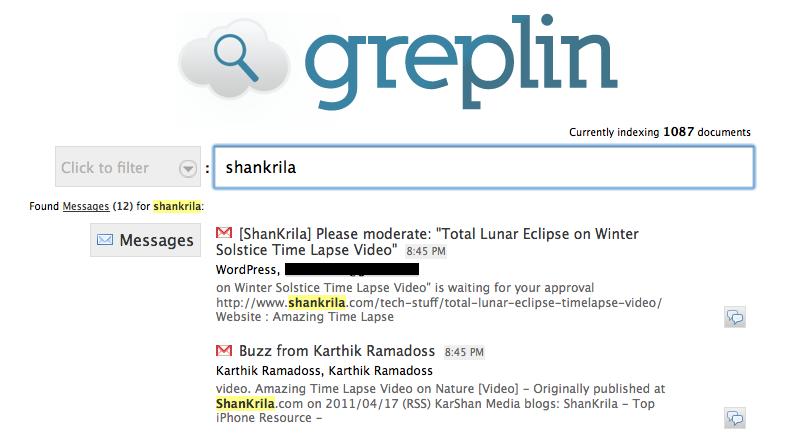 Google might pride themselves of search kings, but Greplin seems much faster searching in Gmail. Once you add your accounts to Greplin, it starts indexing your messages. Greplin is free for most personal services and they charge to use it with professional accounts like Google Apps, Salesforce, Basecamp, etc. Greplin is available as Free, Premium ($4.99/month or $49.99/year) and Premium Plus ($14.99/month or $149.99/year). Greplin also has a free Google Chrome extension that makes it easy to use it in that browser. When I look at a service such as Greplin, I get a little nervous about granting access to all my personal data to another company. However, Greplin seems to atleast have all the basic security measures in place. They use OAuth to authenticate to your accounts and don’t store your credentials. And Greplin defaults to HTTPS when you are logged in so your information cannot be eavesdropped. Also Greplin makes it easy to delete your account anytime you want to. At the moment, I am giving Greplin a shot with a free account and will give it a month to see how much I really use this service.